So How Is Trenchless CIPP Pipe Lining Installed? 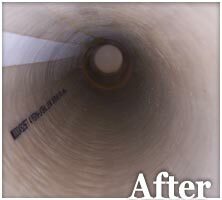 The vast majority of pipe rehabilitation in the United States uses cured in place pipe (CIPP) lining. 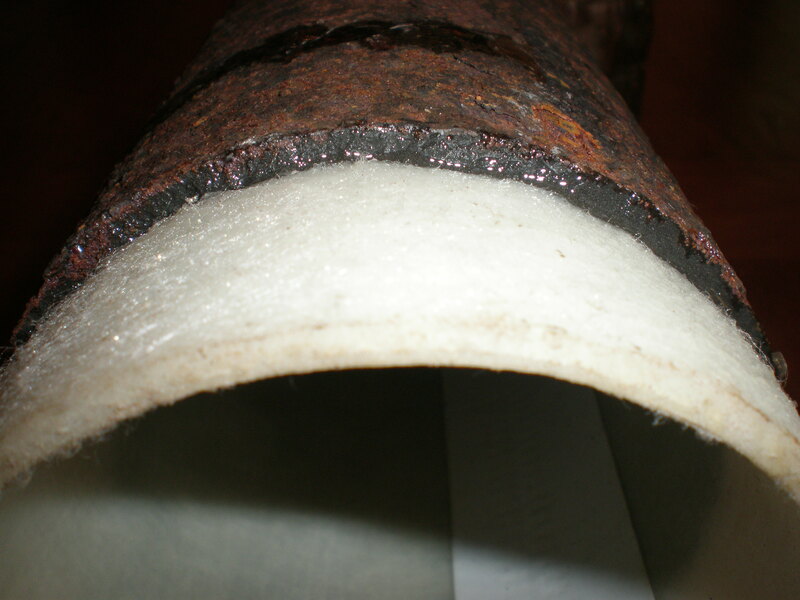 Cured in place pipe lining involves inserting into the old pipe a long fabric tube or sleeve (typically fiberglass or polyester) that has been thoroughly saturated or wet out with a resin. 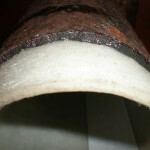 Once the sleeve (or “liner”) is inside the pipe, it is inflated with water or air, and the resin is hardened using heat. Any pipes, vertical or horizontal, in the range of 0.5″ – 48″ can be lined using cured in place pipe lining. The limitations are diameter and the type of fluid in the pipe. For pipes larger than 48″, a spray-on epoxy pipe lining process is used. Various liner manufacturers have been approved for different kinds of pipes, based on the fluid the pipes convey. Some liners for example are not approved for potable drinking water pipes. Other liners may not be approved for pressurized pipes. Be sure to get written verification that the liner being installed is approved for your application. For example, just because a liner is approved by the National Sanitary Foundation (NSF), IAPMO and EPA, does not mean it can be used in fire suppression pipe lining. What Happens To Pipe Connections That Are Covered Up? The new internal pipe lining will block off pipe connections, which have to be re-opened after the curing process. Most of the time this is done by sending a robotic cutter down the lined pipe, and with the use of a pipe video camera, the cutter can see the indentations or “dimples” where the pipes connections used to be. The cutter then cuts out the lining obscuring the connection. 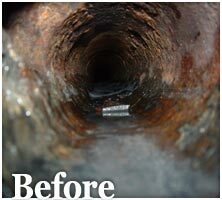 First the problematic line is cleaned of all debris using a high pressure water jetter. Then a recorded video inspection diagnoses the cause of the problem and a decision is made as to whether the underground pipe can be lined or has to be replaced. The video cable itself measures the length of rehabilitation required and the customer is given an estimate for the pipe rehabilitation immediately. If the pipe is going to be lined, a flexible fabric tube with polyester felt on the inside and a flexible PVC coating on the outside is measured and cut to the correct length. Next a 100% epoxy resin and catalyst are mixed and poured into the inside of the pipeliner. One end of the pipe liner is closed off to be airtight and rolled up inside an “inverter” unit. The “Inverter” forces air into the pipe liner turning it inside out so that the smooth PVC lining is now on the inside and the resin-saturated fabric is on the outside. The air pressure also “shoots” the lining down the pre-measured length of pipe. Another tube called a “calibration” tube is then shot down the inside of the new PVC liner and maintained at constant pressure in an inflated state to force a bond between the host pipe and the new PVC line. In 3 hours when the resin has hardened, the calibration tube is extracted leaving behind the jointless new PVC line on the inside of the old pipe. This new PVC pipe is called a “cured-in-place” pipeliner. If needed, a “reinstatement cutter” is sent down the new line to cut open the connections with other lines. A final recorded video inspection along the entire length of pipe confirms the successful rehabilitation. In most cases the pipe is put back into operation the very same day.